Former physics majors Keith Cheveralls ’09 and Daniel Beller ’10 and current physics major Netta Engelhardt ’11 have been awarded the prestigious National Science Foundation Graduate Research Fellowship. The fellowship recognizes and supports outstanding graduate students in the US who have demonstrated exceptional promise in science research. Keith is currently a first year graduate student at UC Berkeley; while at Brandeis he did his senior thesis with Professor Jane Kondev and was a co-author on a paper that appeared last year in the Proceedings of the National Academy of Sciences. Dan, a first year graduate student at the University of Pennsylvania, completed his senior thesis at Brandeis with Professor Zvonimir Dogic and Professor Robert Meyer. Currently, Dan is conducting research on liquid crystals in the group of Professor Randall Kamien at UPenn. Netta is currently doing her senior thesis with Professor Matthew Headrick, and is planning to attend graduate school in physics next year. Refereeing papers, like refereeing sports, can be a thankless task. Reading and reviewing papers on short deadlines for pushy editors for no financial gain and little recognition is a duty taken on by academics, who often seem to like nothing better than to complain about it. Perhaps in recognition of this, the American Physical Society has initiated a selective award program to recognize scientists who have been exceptionally helpful in assessing manuscripts for publication in the APS journals. The program annually recognizes approximately 150 of the 45,000 currently active referees. Among the 144 Outstanding Referees of the Physical Review and Physical Review Letters journals, as chosen by the journal editors for 2011, is Professor Robert Meyer of the Brandeis Physics department. Simple building blocks that self-assemble into ordered structures with controlled sizes are essential for nanomaterials applications, but what are the general design principles for molecules that undergo self-terminating self-assembly? The question is addressed in a recent paper in Physical Review Letters by Yasheng Yang, graduate student in Physics, working together with Profs. 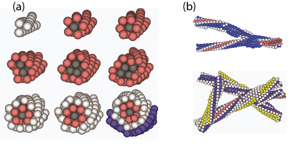 Meyer and Hagan, The paper considers molecules that self assemble to form filamentous bundles, and shows that chirality, or asymmetry with respect to a molecule’s mirror image, can result in stable self-limited structures. Using modern computational techniques, the authors demonstrate that chirality frustrates long range order and thereby terminates assembly upon formation of regular self-limited bundles. With strong interactions, however, the frustration is relieved by defects, which give rise to branched networks or irregular bundles.